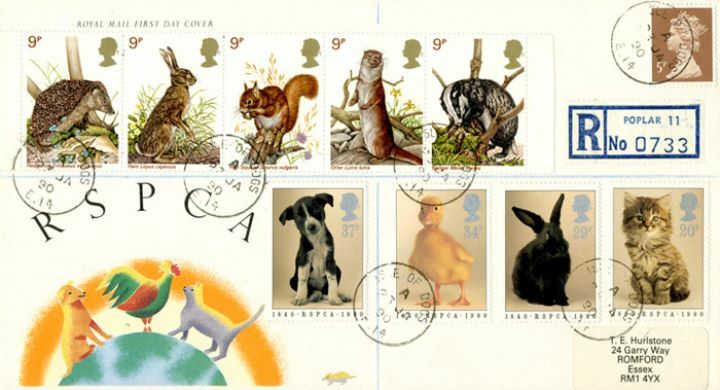 Notes: Superb cover with both the RSPCA and British Wildlife stamp sets. The above Royal Mail RSPCA stamps were issued on 23 January 1990 by Royal Mail and feature the following stamp designs: 20p Kitten; 29p Rabbit; 34p Duckling; 37p Puppy. The With Wildlife Stamps first day cover with the Isle of Dogs CDS Postmark postmark has been produced by Royal Mail/Post Office and features these stamps which can make a very collectible and lovely gift.